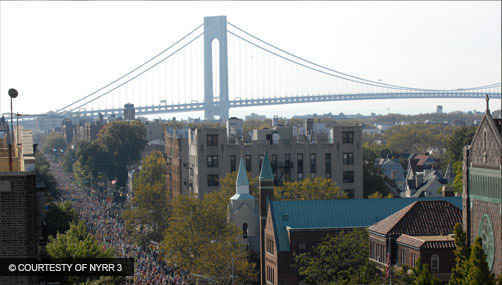 The New York City Marathon is the most popular race of its kind (42.195 kilometres) held annually in the world. It is traditionally held on the first Sunday in November. 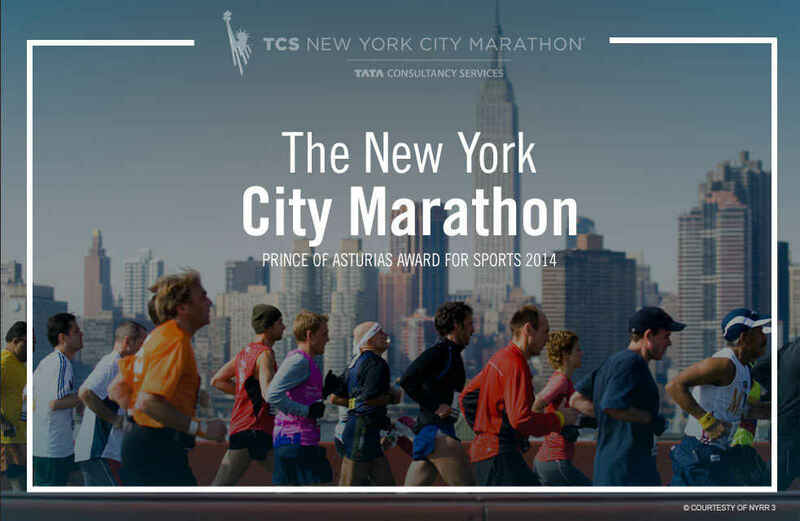 It was founded in 1970 by Fred Lebow (1932-1994) and organized by the New York Road Runners, the club he was president of. 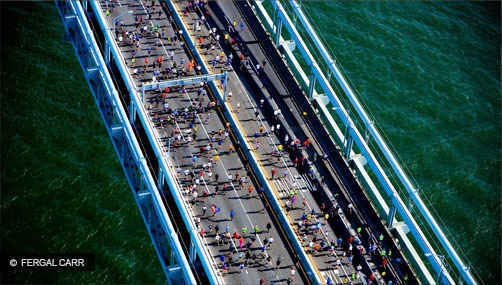 Only 127 runners competed in the first race, paying a registration fee of $1. 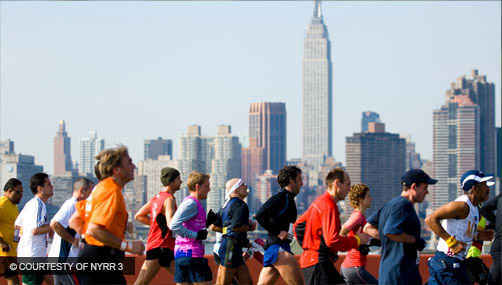 Only 55 competitors crossed the finish line after completing a circuit that consisted of several loops around the Park Drive of Central Park, on the island of Manhattan. Six years later, Lebow decided to redesign the course so that it traversed all five boroughs of the city, from Staten Island to Manhattan, through Brooklyn, Queens and the Bronx. 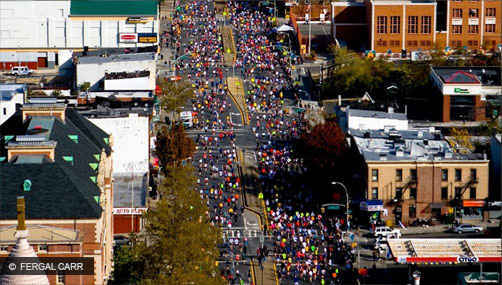 He managed to raise participation to 2,090 athletes, including Olympic Marathon champion Frank Shorter, and to catch the attention of the media and residents, who lined the entire route to cheer on the runners. 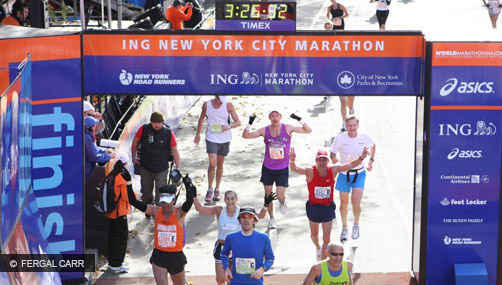 Since then, the New York Marathon –integrated in the World Marathon Major along with the Boston, Chicago, Tokyo, Berlin and London Marathons– has grown steadily, becoming an athletics event of international scope in which more than 50,000 participants, including professionals and amateurs, currently cross the finish line. 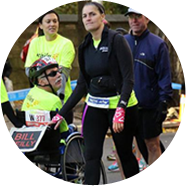 Bill Reilly is an experienced New York City Marathon participant, with 15 five-borough runs to his credit, but his view of the course is a little bit different. Reilly, who has cerebral palsy and is a member of Achilles International, competes in a three-wheeled racing wheelchair. He uses the strength in his legs to push himself forward while facing backward. Reilly and other athletes with disabilities start the marathon ahead of the main field. On November 3, his three volunteer guides—Harold Chayefsky, Wendy Furtado, and Ariel Krieger—ran alongside him for 26.2 miles. They train with Reilly, and they often alternate duties on runs, one sprinting ahead to keep the course clear, while the other two stay behind to steer the wheelchair—which is no mean feat on crowded sections of the course, like First Avenue in Manhattan. 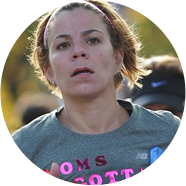 A year after she lost her home during Superstorm Sandy, Staten Island resident Jen Correa completed her first-ever ING New York City Marathon on November 3, 2013. 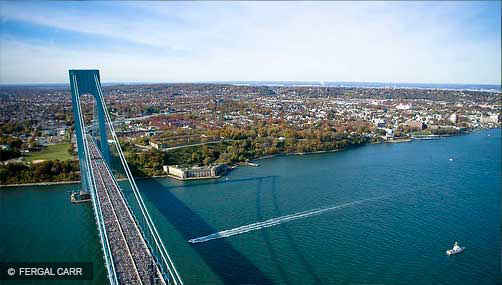 The Brooklyn native grew up just across the Verrazano-Narrows Bridge from Staten Island. 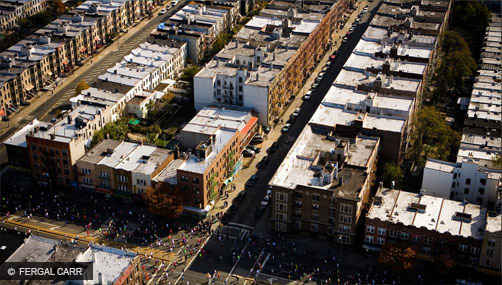 “There was nothing to prepare me for the energy on that mile-two downhill into Brooklyn,” she said of the opening miles of the marathon on November 3. She got an additional boost from seeing her mother cheering on Fourth Avenue. The excitement of running her hometown’s marathon, combined with the support from spectators throughout the 26.2-mile route, propelled Correa to a finishing time of 4:29:45. “I ran by myself, but I never felt alone,” she said. Looking to the future, Correa said, “This next chapter for me is about paying it forward.” She hopes to use her experience in the wake of Sandy to help others who find themselves facing similar challenges. Soon after the marathon, she and many of her fellow Staten Islanders banded together to collect items for families in the Philippines who were displaced by Typhoon Haiyan. 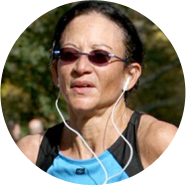 Susan Branche watched her first New York City Marathon by accident. In 1980, while in graduate school at Columbia University, she was on a run when she saw a crowd gathered at the entrance to Central Park at 90th Street and Fifth Avenue. Minutes later, she was amazed to see Alberto Salazar powering by en route to his first of his three consecutive wins. During the 2011 race, she recalls, a woman on First Avenue shouted “You are all so incredibly beautiful!” to the waves of runners. In 2005, her two sons made signs to support her and to be more visible as she ran by them. She still has the signs. 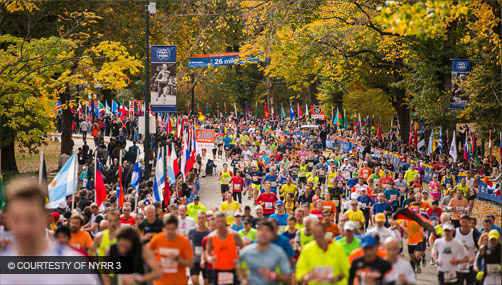 Branche, now a psychologist living in Scarsdale, NY, has come to know from her experience where runners need support the most, and how to stand out in the crowd of spectators. She won't be running this year, but she plans to watch in Harlem, encouraging runners as they approach the course's final tough miles. 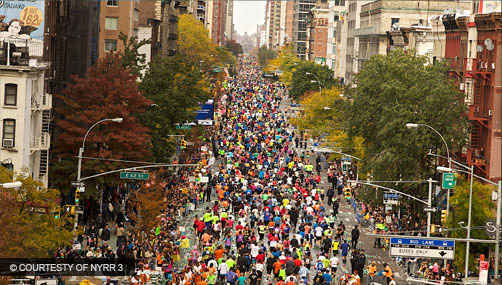 If you've ever run the New York City Marathon, there's a good chance you were helped on your journey by Carmine Santoli. 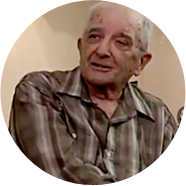 The 87-year-old Santoli has been captain of the mile 6 fluid station, on Fourth Avenue in Brooklyn, for over three decades. Year after year, he's mobilized his neighbors to set up the station and distribute fluids to passing runners on race day. It's always been a family affair for the Santolis; Carmine's son, Philip, has long served as co-captain. Sadly, Santoli has suffered poor health and will be unable to manage the fluid station this year. But he's determined to come out and cheer for the runners, and he's passed the torch to one of his extraordinarily capable co-captains, Alex Duarte. To honor Santoli's incredible service, mile 6 will be called the “Carmine Santoli Celebration Mile.” Give a wave as you grab a cup of water or Gatorade on Fourth Avenue near 23rd Street. 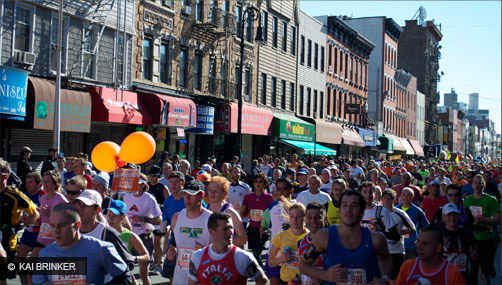 You'll be honoring the spirit that makes Marathon Sunday special for this community.